Yes, I am still reviewing Koko Lashes back from when I ordered on Black Friday but this is the last pair of lashes I ordered from back then! 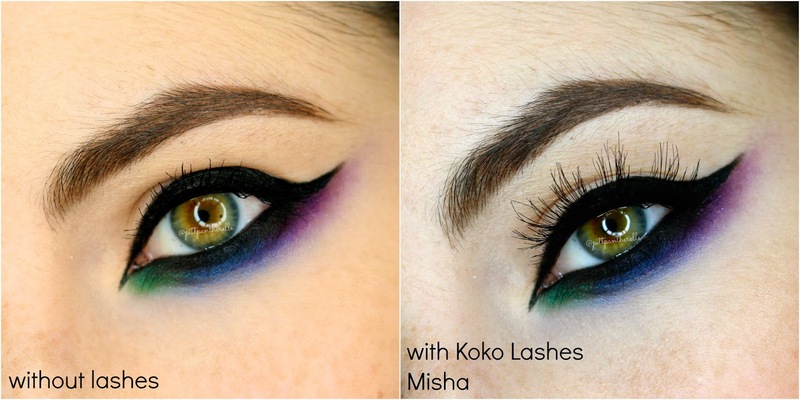 Today, I am reviewing Koko Lashes Misha. Same as the Foxy, Ariel, Risque, Koko, Iris, Bella, and Goddess style. The packaging is thin, non-bulky, and quite cute. The name of the lash on the back of the box and the tray of the lashes. These lashes were easy to apply. These lashes have a thin band and were lightweight. I waited around 20 seconds before I applied the lashes (using House of Lashes lash glue) and they were easy to move around before I was satisfied with the placement. I did not need to cut them since they were the perfect size for my eyes but that will depend on your eye shape and size. These lashes were extremely comfortable during wear time and I wore them for about 5-8 hours each use. They didn't feel like they were there and felt like they were part of my lashes. None of the sides lifted during wear and the lashes came off easily with oil-free makeup remover. None of the hairs were bent or altered in any way after multiple uses, and they withstood my abuse. They look practically the same as the first day I used them. The quality of the lash fibers were great and were similar to the style of Iris. They were not as soft as mink lashes but were great quality human hair lashes. The hairs are of slightly better quality to Ardell lash hairs, and I think for the price, these lashes are great quality. I got these for $4.89 on sale but they are $6.99 retail price. Yes. I love the wispiness to these lashes and how they don't completely block whatever color I put on the lid. These lashes are a dead on dupe to House of Lashes Siren and a wispier version of House of Lashes Bambie. These lashes are a great alternative for House of Lashes if you find them too expensive.